The use of x-rays has long been established as a way of helping medical staff confirm a diagnosis. Using small doses of ionising radiation the proposed area of the anatomy is ‘photographed’ whereby the radiation is passed through the body and as it hits different tissues of differing densities, an image can be gained showing the specified parts of the anatomy. This image can become imprinted onto a film that can be kept for many years, or as is becoming more modern, stored on a database with the patient’s records. An alternative use of x-rays is to use injectable dyes, such as during angiography, which show up on the images and can highlight problems within the body. How Can Chest X-Rays Help Diagnose Heart Problems? Not only useful for seeing the skeleton, some degree of soft tissue can also be seen on the x-ray.The exact location and size of the heart can be established on a chest x-ray along with any fluid retention or enlargement of the organ as may appear in the presence of congestive heart failure, diseases of the heart valves or congenital heart disease. As fluid accumulates, the heart can appear compressed and fluid can be seen in the lungs often as well.It is also useful for determining whether there is an aneurysm or other swelling of the larger blood vessels and can prove useful for beginning to make an accurate diagnosis of any heart problems. Undergoing an x-ray should cause no pain or discomfort. The procedure takes a matter of minutes and, for most people, it is no different than having a normal photograph taken.Most often a visit to your local hospital, and the radiology or out-patient departments in particular, will be required. Appointment turn over is relatively fast as the x-rays do not take long to gain, so long waits are not often likely unless there has been an influx of emergency x-rays needed. You may be required to change into a hospital gown to gain a clearer image as these are usually made of thin plain material, and you will need to remove any necklaces or body piercing from the area to be x-rayed.The results of the x-ray will need to be examined by a radiologist and a cardiac specialist to determine whether a diagnosis can be made, and whether further tests are needed. Are X-Rays Safe to Use? On the whole, x-rays are safe as the amount of radiation that the person is exposed is minimal. It is however important to tell staff of any medical or mobility disorders that may hinder the ability to position oneself as needed. It is also vital that pregnant women inform the staff of their pregnancy and consideration will be given to whether the procedure can wait until after delivery or whether protective clothing such as a lead apron should be provided in the presence of urgent treatment. 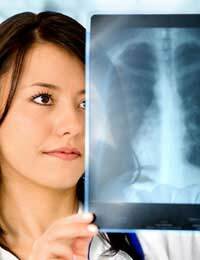 Chest x-rays are very useful in modern medicine and are extremely helpful in assisting the medical staff in the initial stages of diagnosis confirmation. They are safe to use and once the expensive capital equipment has been purchased are a relatively cheap and fast method of a patients treatment.